The Japanese art of flower arrangement (生け花 ikebana – living flowers; 華道 kado – the way of flowers) is more than simply placing flowers in a container. It is a disciplined art form that aims to express the natural beauty of the plants used, through arranging them in a harmonious way that draws attention to the shape, line and form of the plants. 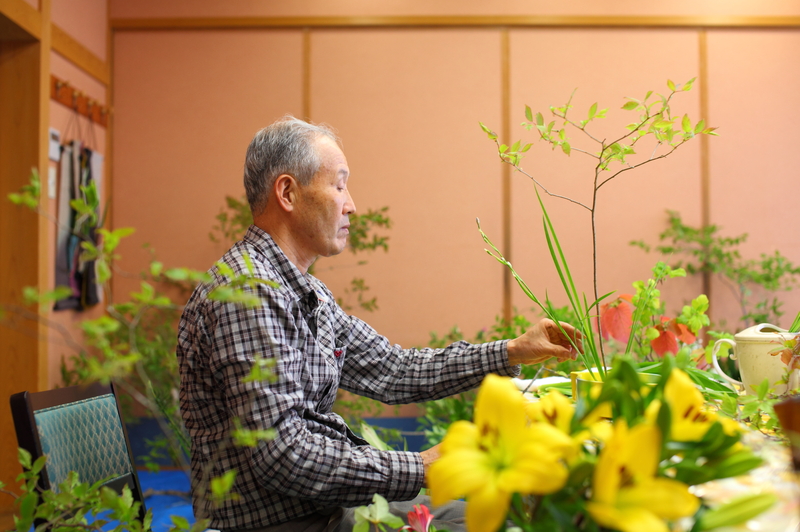 The plants and flowers used in arrangements at Kifu no Sato are all locally grown and seasonal; carefully selected by Kifu no Sato’s exclusive ikebana master, Kuroda Koyo. On Mondays and Fridays, it is possible to observe Kuroda-sensei at his work. 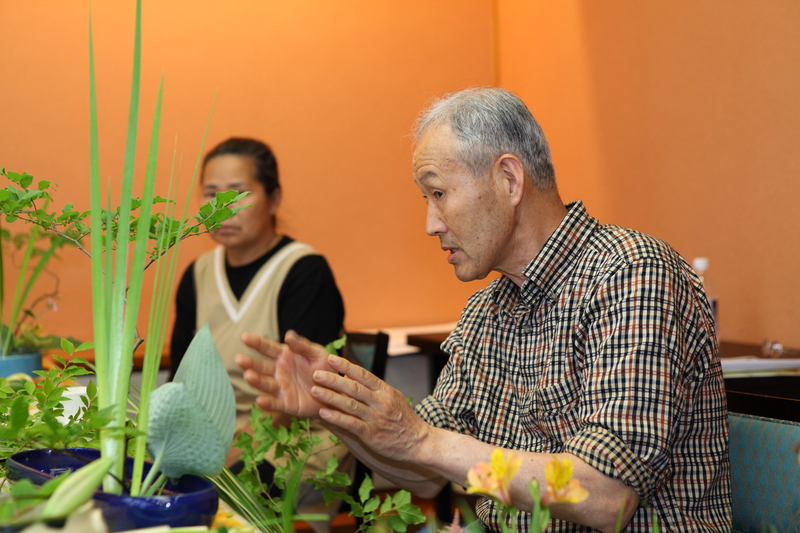 Kuroda-sensei is qualified in the traditional Ikenobo school of ikebana, and has been practicing for decades. It is possible for guests to stand directly behind him to watch as he carefully creates an arrangement through actions such as modifying the shape of the plants with scissors, manipulating branches with his hands, and more. When the arrangement is finished, Kuroda-sensei will give an illuminating explanation about his intentions behind the arrangement. Afterwards, if there is time, Kuroda-sensei may invite you to try your hand at flower arrangement if you wish. You will be provided with the plants, and given peace and quiet whilst you work on your arrangement. Attempting to create a satisfactory arrangement whilst trying to remember the basic principles of Japanese aesthetics and the tips and pointers from Kuroda-sensei, one definitely gains a new appreciation for plants and the skill required to create a beautiful arrangement. Afterwards, Kuroda-sensei will examine your arrangement, correct it, and provide an explanation once again of the principles. 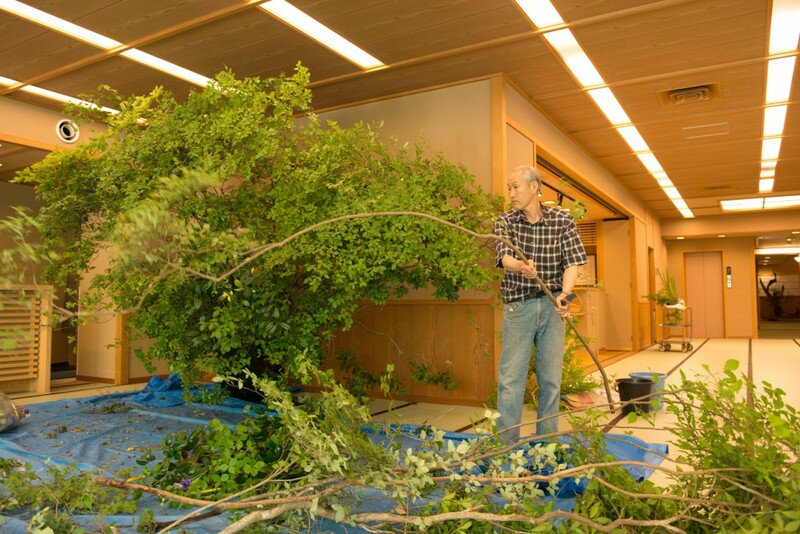 If you would prefer to watch Kuroda-sensei and would not like to try ikebana, you are also very welcome to do so. Other than arrangements done in portable vases, it is at times also possible to watch Kuroda-sensei working on the larger, immovable arrangements. If you would like more information, please do not hesitate to contact Kifu no Sato.